Church Door Hangers is rated 5.0 out of 5 by 1. Reach your community with full color printed door hangers for your church. Rated 5 out of 5 by Lewis from They are just what I wanted. They work great on all kinds of doors. The printing was good too. 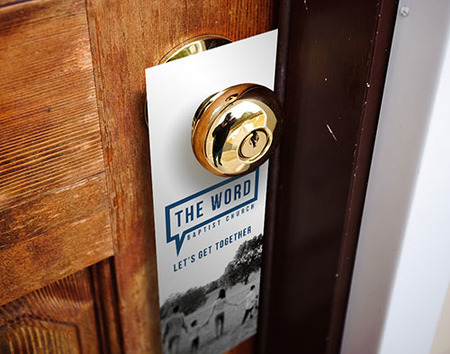 Door hangers are a simple and effective way to let your community know about your church. In a hurry? Same Day and Next Day turnaround services are available for orders sent to press by noon CT. Call us at 877-405-3949 for additional sizes or custom options. Before printing your door hangers, use our layout templates to check whether your artwork is laid out correctly. Find the size of your custom door hangers, download the template, and place your artwork on the template. You can easily verify the correct dimensions for full bleed and die cutting the doorknob hole. Don’t forget to check that any text or critical images are inside the caution zone line. Door hangers are an excellent tool to engage people in the neighborhood. Consider adding a perforation to the bottom to create a tear-off. This could be a business card or “coupon” to use at your church. Whatever creative way you decide to use it, it is something potential attendees can tear of and keep to remember your church. If the tear-of acts as a ticket to an event, attendees will bring it with them, allowing you to track the success of your outreach campaign.